Currently I’m investigating landscape, materiality and process in painting, as I undertake a Master of Arts (painting). Specifically I’m looking at changes in thinking that underpin contemporary practice with regard to these things, via analysis of work by Julie Mehretu, Ingrid Calame, and Peter Doig, while drawing on aspects of critical theory. I'll use this page to discuss modes of practice and cultural debate relating to my project, as well as philosophical issues that shape the experience of contemporary painting, and to show my methodology and flow of ideas. Here are some photographs showing me gathering information from the landscape sites. The work was made in Whaingaroa Raglan, and on Mount Taranaki in 2018, New Zealand. I’ve been looking at Judy Millar’s beautiful paintings and enjoying their scale, the way the interact with their surroundings, the tonal qualities, and use of gesture. Because my project focuses on materiality, process and landscape, I’ve also been looking at her work with this in mind. Millar’s work draws from abstract expressionism in the way it examines and deconstructs ‘gesture’. Instead of using gesture to signify an artist’s subjective expression, as it was used during the 1950s when abstract expressionism was becoming a thing, here Millar looks at gesture in an objective and constructive manner. She pulls apart ‘gesture’ and makes it the main thing, not just a convention used in the process of painting. She makes gestural marks into large three-dimensional structures that weave around interior spaces, for example in ‘Giraffe-Bottle-Gun’ in La Maddalena, 53rd Venice Biennale, 2009, or in paintings where lively gestural marks do the same on a two dimensional surface. Historically (in 1950s), abstraction, gesture and artistic expression became central pictorial themes, as gesture broke away from the constraints of its relationship to representation. Jackson Pollock’s work exemplified the two main factors of abstract painting of this period - the artist’s expression, and activity of production. Artists have been using gestural abstraction in an analytical way since the 1980s - “the immediate, emotional effect of gestural painting has been superseded by an intellectual concept. The gesture is no longer an ‘indexical sign’ but signifies only the idea, the concept of spontaneity”. How has Millar’s use of gesture developed these ideas generated in the 1980s? Who are the other artists using gesture in generative ways? Another artist who uses gesture in her work is Julie Mehretu. She uses gesture as tool to isolate marks in her painting, and in making these marks has found a generative process that she calls ‘disembodied thinking’. She says this process is foundational in her work because it opens up a whole new way of thinking about painting that was intuitive and instinctual. Gestural marks ‘pierced, invaded, devoured, consumed and spit out of the structures’ in her paintings, and as they unfolded on the canvas they created new structural forms - ‘the whole painting composition felt like this explosive image, teeming with activity, but suspended in entropy’. These gestures then became a lexicon that she has used throughout her painting practice. I’ve been reading books on abstract painting to get a historical perspective on what was happening in this area twenty years ago. It was an interesting exercise because in 1993-1996 I was doing my Bachelor of Fine Arts at Elam in Auckland, and back then it was contemporary for me. The work I made back then was dealing with this stuff – gesture and the concept of spontaneity, the materiality of it all. I remembered why I was drawn to abstraction – a painting relatively free from prescribed visual cues that distract us as viewers from seeing what a painting may be conveying through paint. - ‘Abstract painting dispenses with the relatively unambiguous analogy of signifier and signified’. And the physical nature of painting where gesture takes front of stage, and where gestural painting implies physical action “a gesture on a large scale in which the artist transfers the movement of their whole body or at least their arm to the picture”. How can I contextualise my project in 2019 in the developed framework of abstract painting? I’m using gesture in the wrappings and rubbings, it’s evident there that I use my whole body, but it is not my spontaneous personalised marks that are being left on the canvas, but the marks from the texture of the surfaces, and the interplay with the ink and water and drips, and my body/arm as I apply the paint. Is this gesture? Is gesture acting as a generative tool in my work? I do wonder, after reading about Julie Mehretu’s use of gesture, if perhaps the wrappings and surface texture I’m making on site in the landscape could somehow be viewed in the same way she talks about her marks as ‘disembodied thinking’. Because I’m there in volatile conditions, vulnerable to environmental elements and changes, and constrained my my physical limitations in applying paint to the canvases on the spot, are the marks I pick up on the canvas somehow also residue of this intuitive and instinctual process? Can I then take these marks and use them in my painting to further cement my experience of these landscapes? In a video titled ‘Julie Mehretu: The in-between place’ Julie talks about her work as representing an ambiguous and other-worldly space . Her work layers references to recognisable places with her own mark making language, by combining this array of drawing into one painting she offers a painting that is “making sense of a place from a very different place”, providing a sense of space that the viewer can move into, where they can experience a new geography . Ingrid Calame also does this by layering tracings of different aspects of her sites. Mehretu’s work has different levels of reading - as a whole the work has a beautiful and imposing and organic impact, and up close it has a totally new reading as the depth and layers of imagery emerge. There is not a clear view but a multi-layering of architectural drawings and plans of buildings overlaid with intuitive gestural drawing, which becomes apparent as you take a closer look. A new image emerges from the intermingling of these images as the levels of imagery become fused, and this occurs during the making of the painting. This is somewhat true for the work of Claude Monet, the forerunner of Abstract Expressionism, Calame, and various other artists. Other artists whose work I’ve looked at have a sense of the in-between going on in their work. 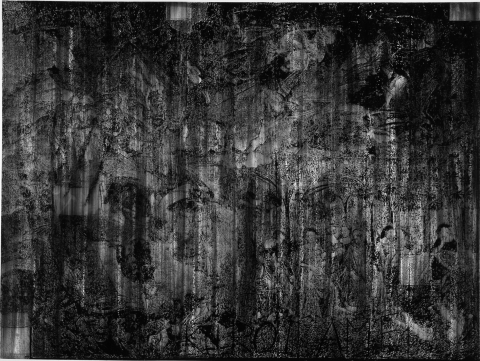 The superimposing of images used by Alain Huck, David Ratcliff and Julie Mehretu; the materiality of the painting disrupting recognisable imagery by Cecily Brown, Peter Doig, and Marina Rheingantz, and the use of reflection, mirroring or repetition to distort imagery are effective ways to do this. All these methods distort or disrupt recognisable imagery, which invite the engagement of your imagination while looking at them, while still providing some links to the original source material. If I relate Jane Bennett’s theory on vibrant matter to this idea of an ‘in-between’ place, it might describe the sense as coming from the landscape matter itself. Bennett explores the ‘resistant force’ that things have to the meanings we interpret about them and place on them, and suggests that they not only deflect these meanings but exert their own self-generated energy or messages. She suggests that there is a kind of autonomous energy that can be encountered which could explain the sense of an in-between. Mehretu says in her video “these marks couldn’t exist with just rational thinking”, but they needed a bit of arranging. It’s almost like the process an artist can undertake is to observe a site from many different aspects, and then collate imagery in a painting for this in-between thing to occur. Jean-François Lyotard and Bennett share the view that it is in an encounter or an interaction between things where understanding occurs. In Scapeland  Lyotard says that there is more to a landscape than its physical description, but that it is an encounter. I’m suggesting that the encounter between people and landscape is where the in-between can be experienced. He goes on to say that landscape is more than what we can know or describe about a place, landscape is unknowable in its fullness. And that in a landscape we are unsettled and have a sense of displacement. Linked to this idea of the in-between is the idea of the sublime which has been talked about for at least a couple of hundred years. In an article titled ‘Contemporary Art and the Sublime’ Julian Bell describes the ‘sublime’ as ‘a controlled encounter with power that is beyond our control’. Bell’s article talked about the terrifyingly delightful reactions we have to the untamed power of the natural world, almost like an adrenalin rush, and although my practice is not about this, I can utilise this history of the sublime to represent the wonder and fascination with representing the imagined about a landscape. It was a really sunny morning in Paris, the day Maryanne and I walked from our hotel to the art gallery where Monet’s big paintings were. It only took about half an hour and was so good to get out and walk to get my bearings in this huge city – a bit of a change of scenery for a couple of kiwi girls. We went to three museums on our weekend in Paris, and this museum was one of my favourites because it was smaller and not so crammed with people queuing and walking around in the galleries. We used our museum pass (I loved it that we didn’t need to queue) and wound our way around to the main gallery. And here we were, right in front of Monet’s huge water lily paintings. I’d heard so much about them, and kind’ve of idolised them in a way, like they were sophisticated French celebrities. Once I got over the excitement of actually being here, I found them to be calming and quiet kind of paintings, even though their 12m long scale is imposing. I could walk alongside them back and forth and really get to know them. And after a while of enjoying the beautiful aesthetic and scrutinising the brushwork, they lost some of their celebrity status and settled into a place that was more normal and familiar. I walked up close and the surface was a muddle of murky colour and the texture was a bit like exterior house bobbly plaster. Up close it didn’t look anything like landscape, but as I walked back and took in the whole painting it all made sense. He painted reflections of vegetation and sky in water, and noted how different the light was from morning to evening. The custom design of the galleries added to the order and calm I experienced with the work, and the many people engaging with the work seemed to be part of the hum about the work. Each room was the shape of an oval and had four of the paintings hung on their walls, so you could stand in the center and spin around and see all four continuously, through all the crowds of people mingling in the room. Monet wanted to make an immersive experience for people to view the paintings, and so he designed the rooms to have a lot of natural light by which to see the paintings, and the oval shape of the rooms. I was fascinated that he had so much vision and follow through to plan and execute the paintings and the physical space to house and present them for years to come. Then we went downstairs to the exhibition Waterlilies: American Abstraction and last Monet. I was so excited about this one – Claude Monets’ work alongside the work of some of artists who have been the most influential in my painting practice right from when I was at art school at Elam twenty years ago. And here I was with one of Helen Frankenthaler’s huge and lovely paintings, looking like all my Christmases had come at once. It was more impressive than I imagined. The colour was delicate and yet strong, I think it was because the colour values were rich even though they were transparent. And the sheer size of it allowed the colour to soak into me, it filled my line of sight and imposed it’s voice and authority in a gentle manner. And around the corner I came face to face with a painting by Joan Mitchell, then Philip Guston, Jackson Pollock, Sam Francis – I could hardly contain myself! As a child, growing up and living in New Zealand, and even doing my study as an art student, I only ever saw these paintings in books (yes books not the internet). And in books they take on a whole other identity – small and in print on a thin glossy page. All the paintings become unified and simplified and codified somehow. So seeing them in the flesh was a new experience of them, and I understood them in a new way. I was mesmerised by Helen Frankenthaler’s use of colour and scale, and the dry and absorbing nature of it all on unprimed canvas – it had an organic thing going on. The paint work of Mark Rothko and Joan Mitchell, although poles apart in technique were also so beautiful to see. The paint’s physical presence was something else and satisfying to look closely at. American artists had the opportunity to sit with Monet’s Water Lilies when exhibited at MoMA in New York in 1955, and Clement Greenberg wrote an essay ‘American-Type Painting’ where he drew connections between the work of Monet and some of the American abstract painters. Then in 1956 art critic Louis Finkelstein compared the work of Monet and a select group of artists including Joan Mitchell, Jean-Paul Riopelle, Sam Francis and Philip Guston and distinguished them from abstract expressionism by calling it ‘abstract impressionism’. I need to find out if paintings like these came to New Zealand in the 1950s (or any other time), to see what artists here had the opportunity to see in the flesh. Being with these paintings made me consider how their physicality impacted me. Not only the large scale, but the way paint was used made me want to run my hands over them, they engaged me. This is what I want my paintings to do, to engage people in an experience of them. I also saw how my work has been tangibly influenced by this history of painting, and how it has given my practice legs. in particular, colour, scale, and the materiality of paint. Seeing how decades later, American abstract painters were re-imagining some of the ideas that Monet had been interested in, has shown that painters across the generations influence each other. There was so much more that impacted me here in this exhibition, and I am so grateful for the experience. This was my favourite exhibition of my time in Europe this year, it was like meeting old friends, and I can’t wait to get back into the studio to make some more paintings. I wonder if they would be really miffed about being put together like this (again). Clement Greenberg and Harold Rosenberg’s ideas on abstract expressionism in the 1950s and beyond were so opposing, but I’m thankful that they have articulated them, and I can see how painting has benefitted from both views. Clement Greenberg (1909-1994) valued the formal aspects of painting (line, colour, composition, texture etc ) and used this to evaluate a painting, and he understood abstract expressionism as coming from the chronological development of the painting tradition from one era to the next. He thought that modern painting should be concerned with the materiality of paint, rather than content or pychological states which were susceptible to subjectivity. He was interested in looking at how a painting was painted, not what was painted, and at work that referred back to itself rather than the external world. For Greenberg, painting can justify itself by looking at the history of painting in a self-referential way. Any element that is not essential to painting is discarded, and what is left is modern painting. For example, if perspective can be portrayed in sculpture and photography, then it is not necessary in painting so get rid of it. When everything that is not unique to painting is discarded, then what is left is paint on a flat two-dimensional surface, and this was the best way to look at a painting, he thought. In stark contrast to Rosenberg, he sees that the painting of the 1950s does this self-referential thing, that solidifies connection to its predecessors. Harold Rosenberg (1906-1978) on the other hand looked at abstract expressionism through the lens of subjection and emotion, and described painting as having broken away from all that had gone before. He looked at abstract expressionism in this new light and coined the term ‘action painting’, where the canvas was like an arena that recorded the act of painting (at the expense of formal aspects). He was interested in the subjective, mythical, and existential ideas in painting. In the act of painting an ‘encounter’ or ‘revelation’ can occur, and aesthetic formalist concerns are subordinated to that. In this way Rosenberg is advocating the artist’s departure from formalist concerns, he is saying there is no longer any pressure to stick to them, and more than that, he is encouraging artists to leave that behind. I think of Jane Bennett’s ideas on the encounter between things and what is generated as a result of that. Rosenberg is talking about the act of painting being a conduit for expression to materialise, and Bennett is talking about how an encounter between matter (all things) is the materialisation of expression. They both talk about a ‘coming from within’ kind’ve thing. Action painting came about as an act of liberation from existing moral and social values. Artists wanted their paintings to be freed from the history of the tradition of painting and the rules used to evaluate and read paintings. I think of Julie Mehretu and her endeavour to re-frame the histories of the cities and buildings she paints. As a painter, I want my work to show the values of formalism, and an authentic connection to people and places, and for it to engage with the part of us that is human (not denying that we are more than just physical bodies). I’m also aware that the history of art has been crafted by a dominant culture. The formalist values of the painting tradition were created and supported by a predominantly western white male group of people and their thinking and values. How does this affect the way I think about my painting practice and where I fit? Does that mean that I need to abandon formal painting values because of their narrow and culturally isolated history? Has painting opened up since the 1950s to become a diverse cultural voice? In what ways has this happened? What role do public institutions in New Zealand have in this? How do commercial galleries in New Zealand participate in this? What does representing my encounter of the landscape through the medium of paint look like? What painting conventions or values do I want my work to deal with? What are other artists dealing with in their painting? My work is about the materiality of paint and the painted surface, and what happens in the process of painting is important, and in this way my work reflects some of Greenberg’s ideas. There is also an aspect to my work that is about recording the act of painting - where I paint on-site on the rocks and and land to pick up textures and the character of the place. In this process I’m not thinking so much about the application of paint or formal painting conventions, I’m more thinking about just picking up the surface of the land, and the painting I end up with is almost a product of that. I’d like to see how this combination of approaches to abstraction unfolds.